The story for this dog birthday cake began when I was asked a week before the party to make a first birthday cake for my nephew. I had three other cakes already scheduled for that week, (not to mention my kid's two soccer games the day of the party), so I was feeling a little stressed. When I make a birthday cake for family or friends I like to think about cake decorating ideas for a couple of days before I buy supplies. However, I didn't have too much time to think about the cake and the parents didn't ask for any particular cake design. Fortunately, the idea for a dog cake came quickly to me. My little nephew, Ammon was born into a family that had two big dogs and the previous Christmas his sister received a dog as her present. So living in a three-dog household I figured making a dog cake would work out well. A big party was planned with both family and friends attending, so I knew I needed a two-tier cake to have enough servings. I made an 8-inch cake on the bottom and a 6-inch cake on top. The bottom cake was chocolate with chocolate mousse filling and chocolate buttercream icing. The top tier was chocolate cake with marshmallow filling and chocolate buttercream icing. I found a paw print and dog bone cookie cutter to add a little embellishment to the birthday cake. 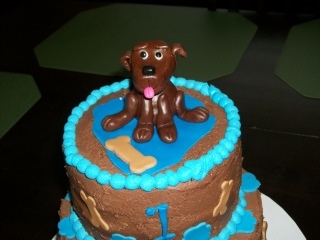 I used modeling chocolate to make the decorations and to make the dog cake topper. 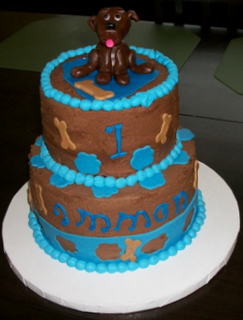 Ammon's first birthday cake was a hit. I was pleased since this was my first dog cake. I think the guests were a little Bow-WOWed!